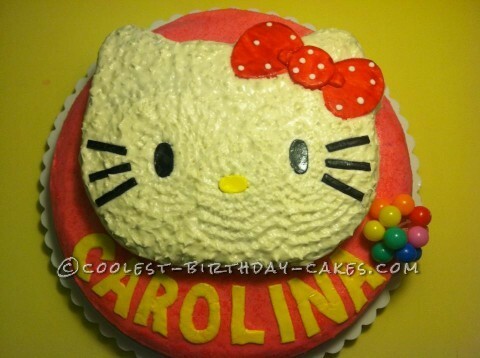 My 5 year old daughter wanted a Hello Kitty cake for her big birthday party. My sister-in-law, her sister and I took ideas from images online and decided to make our own design from that. We started with a large round base. Then we made a rectangular cake that we cut out for her face. We first sketched out Hello Kitty’s face on wax paper and used that to cut the cake. We frosted the base with pink frosting (crumb layer first then another layer on top). Then the eyes, mouth, whiskers and bow were made out of fondant, which we cut out and painted with food coloring. Lettering also was made out of fondant. The top part has a layer of white frosting. Then we added the eyes, nose and bow. Using an icing back with flower tip, we decorated the face dot by dot to give it texture. Then we added the whiskers last.